Caseyâ€™s touch can reveal the one thing a person would never want to know â€” the number of days they have left to live. By the time Casey turns seventeen, sheâ€™s learned to withdraw. But the phobia she fakes in order to avoid human contact is sorely tested by hot, persistent, motorcycle riding PJ. For a girl who craves contact, maple-eyed PJ is impossible to resist. 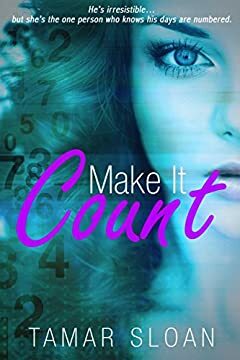 When the inevitable happens; when hands, bodies and lips collide, Casey sees PJ's number, one that can only be seen as a cruel twist of fate. With the memorable writing and humor of writers such as Jandy Nelsonâ€™s Iâ€™ll Give You the Sun blended with the attitude, chemistry and unexpected plot twists of Katie McGarryâ€™s best sellers, Make it Count is a romance that will leave you swooning and smiling.